The International Association of Young Lawyers (AIJA) held its 55th annual congress in Tokyo. This year’s main topic was artificial intelligence and the relating legal issues. Réti, Antall and Partners PwC Legal Law Firm was represented by dr. Miklós Klenanc, attorney-at-law, who has been dealing with liability issues pertaining to robots, self-driving cars and other vehicles, drones, etc., for a while now, and who was elected as the national representative of Hungary in AIJA (an international organisation with more than 2,000 members worldwide) at the event held with the participation of approximately 500 attorneys, in-house counsels and young lawyers. Participants from all over the world arrived with the aim of developing new business and professional relationships – while maintaining their already existing ones – which served as an extraordinary opportunity for gaining prospective new engagements. At the same time, the overall program of the conference provided a good chance for us to confirm that the ongoing professional work in our law firm relating to legal aspects of AI is strong enough to hold its ground and to compete with the currently ongoing international work. Do yo want to be part of a constantly developing team, community? Send us a message via our website and we will contact you. 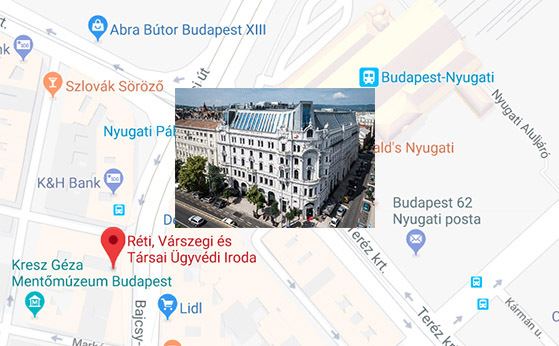 This website is operated by Réti, Várszegi & Partners Law Firm (registered with the Budapest Bar) according to the laws and internal regulations relating to lawyers which may be found on the website www.magyarugyvedikamara.hu along with information on client rights. Réti, Várszegi & Partners Law Firm is a member of the PwC network. PwC refers to the PwC network and/or one or more of its member firms, each of which is a separate legal entity. Please see www.pwc.com/structure for further details. © 2013 - 2019 Réti, Várszegi & Partners Law Firm – All rights reserved.